RCGF series filling machine integrates washing, filling and screw capping. The whole process is automated and is mainly used for the filling of juice drinks. Most of the electrical parts of this machine adopt advanced foreign products. All the places in contact with the liquid materials are made of high-quality stainless steel. The main key components are processed by CNC machine tools. The whole machine photoelectrically detects the operation status of each part. No bottles are not available. 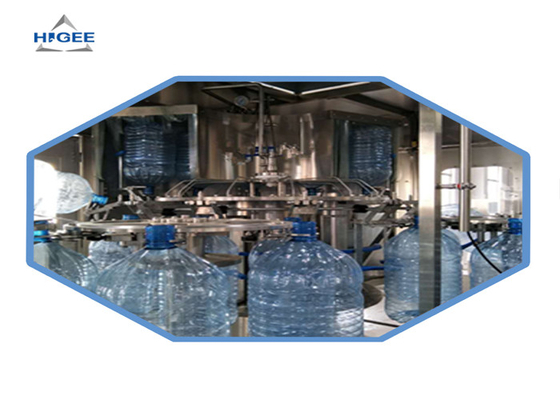 Filling, no bottle without cover, high degree of automation, easy operation, wear, stability, low failure rate and other characteristics, product quality in the forefront of the industry, is the best choice for new and old beverage investors. 1.with bottle neck clipping transmission structure, the bottle conveyance is stable; very convenient and swift to use different bottles for filling in the same machine by adjusting the height of conveyor and several exchanging parts. 2.with Gravityfilling theory, filling speed is quick and precision is high; the filling level is adjustable. 3.With spring type washing clipper, empty bottles are turned 180°along the guiding roll for inside rinsing; the washing nozzle adopts plum blossom shape multiple holes to rinse the bottle bottom, washing efficiency is high. 4.Capping machine adopts France technology, the capping is by magnet torque; the cap catching adopts twice catching to ensure the veracity.The capping force is adjustable, constant torque capping will not damage caps and the cap is good sealed and reliable. 5.The whole machine is operated by touch screen, controled by PLC and frequency convertor etc., with functions of no bottle no cap feeding, waiting when lack of bottles, stopping if bottle is blocked or no cap in cap guiding pipe. -- Filling Capping Labeling solution expert provider! 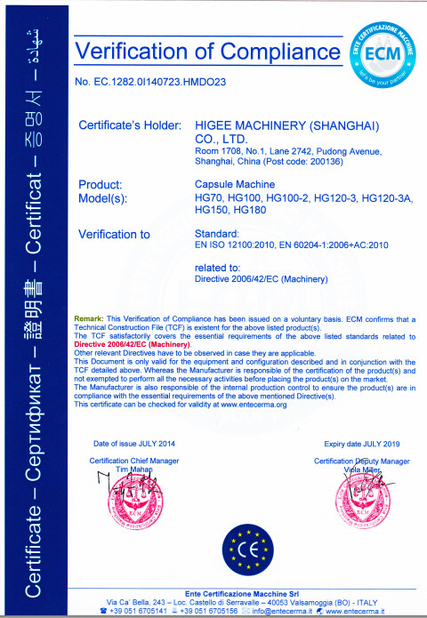 Higee Machinery(Shanghai) Co., Ltd. is an industry-leading manufacturer of automatic filling, capping, labeling and packaging machinery. We have an experienced research and development team that specializes in customized solutions. Our factory builds its machines under the strict accordance of ISO 9001 and CE quality management system. Our professional team provides clients with comprehensive tailored solutions for all kinds of beverage filling machinery with mature technique and first-class quality. More than 60% of our machines are exported globally to 52 countries. Q1: Are you a manufacturer or trade company? A1: We are a manufacturer in beverage machine field more than 10 years, you can have a basic impression on home page of our factory, We can pick you up to visit our factory from airplane port, highway station etc. Q2: What's higee product ranges ? A2: Drink water/juice/carbonated drink filling line. Water, beverage and carbonated drinking treatment line. Performs blowing machine and caps injecting moulding machine . Q3: Does Higee have any certification? 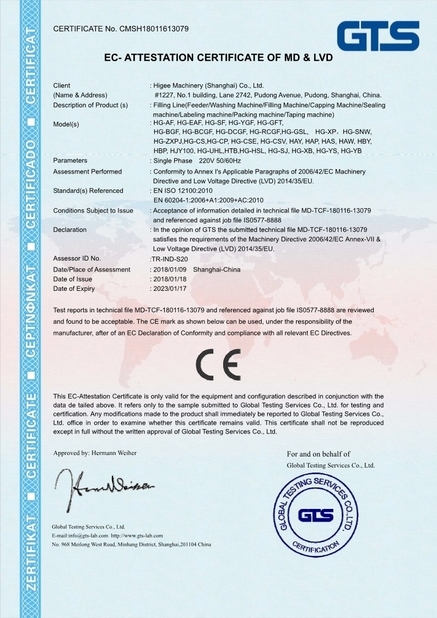 A3: We are certified by CE and SGS. Q4: Before sending a quotation, What information shall be provided? A4: a. What kind of beverage do you want to produce? b. How about bottle volume? 250ml, 330ml, 500ml, 750ml, or else? 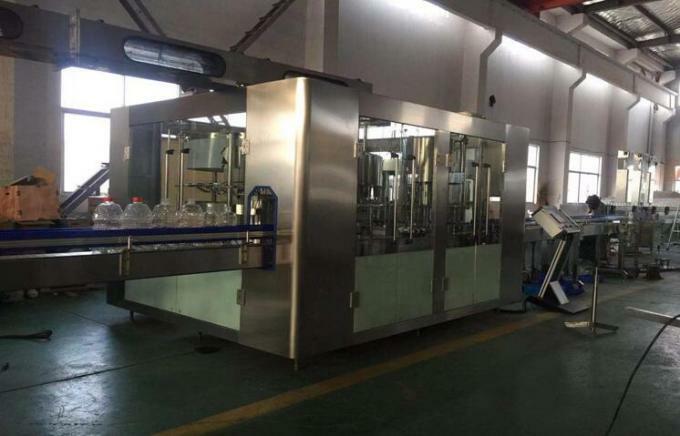 c. Production capacity requirement, how many bottles per hour? d. Raw water analysis report if you have. e. How about your electric power system for 3 phase, in China it is 3 pahse, 380V, 50Hz. Q5: If bottle size changes, is it possible just do some adjustment on machine according to new bottle size? A5: Yes, just need to change some relevant parts. We have a video for teaching how to operate.